Do you know what a doula is? I had never heard the word before until about seven or eight years ago when my sister hired one to help her with the birth of her first child. Now I think doulas are starting to grow in popularity a bit in the United States – at least in Brooklyn! A doula (Greek word translating to “female slave” or “woman who serves”) is pretty much a non-medical labor and delivery coach/assistant/support person. Apparently in most other cultures, it is typical for a woman to have close female support during labor and delivery as well as during the initial postpartum period. In the United States – it has not been as common, though support from a doula has been proven to be extremely helpful in providing for more positive and healthy birth experiences for couples. The doula is not there to replace the father/partner, rather – she is there to offer her support, to teach pain management techniques, to give the parents information on their options and to help them plan for and achieve the type of birth experience they are seeking. I decided to hire a doula for the birth of our first baby NEXT MONTH (holy shitake) mainly, because if everything is medically normal, I am aiming for the most natural birth experience possible. This means, in my perfect world, I will labor at home (with my husband and doula there to support me) for as long as possible before heading to the hospital. My doula (who has assisted in over 200 births) will help me know when it is the best time venture off to the hospital. Of course, since it’s my first baby – I’d probably head over the second I started to feel a contraction! The goal of waiting is to avoid arriving at the hospital super early into the labor process – because if I arrive at the hospital and am not very far along, I will likely end up getting induced to speed things along. From what I have heard/read/learned, being induced does speed things along – but it also causes more intense and often more painful contractions than if labor was allowed to occur in it’s own time. With more painful and intense contractions, it’s often more appealing/necessary to get an epidural or to seek medical pain relief. Now – before I became pregnant, I always thought I’d have an epidural. Though my mom and sister both delivered their babies without pain meds, I didn’t want that pressure. In my mind, I figured… why not? I totally see the appeal. I have friends who had epidurals who raved about how easy their labor and delivery was and how they were actually able to enjoy the process instead of being in pain throughout. Sounded great to me. Then – something changed in me. I think it started when I had a conversation with my close family friend and pediatrician (from when I was a little tot). I asked him what he thought of getting an epidural and he said that any interventions (getting induced, getting an epidural, etc) can quite often lead to more interventions, which can lead to yet more interventions, etc. In other words, something that could have happened quite naturally on it’s own – is now in a spiral of medical procedures and interference, none of which was ever really medically necessary. He also said that birth is the most natural thing in the world and women since the beginning of time have been doing it – without epidurals. He wasn’t judgy at all… just honest – and it resonated with me. Then I started thinking about my pregnancy. Here I am – not drinking coffee (mostly), not taking Advil, not taking cold remedies, not drinking soda or eating sushi or drinking alcohol – all of these comforts I’m going without are in an effort to keep my baby protected from anything that might have any potential to harm or affect him negatively in any way. It started making sense to me that I’d apply that same logic to my labor and delivery. Plus – it’s true… women since the beginning of time have been delivering babies without medical pain relief. I’m a strong person. If they can do it – so can I! Thus I set out along the path of natural childbirth. I hired my doula, Megan. I started reading all kinds of books – my favorite was Ina May’s Guide to Childbirth. Reading about all the intimate, natural childbirth experiences these other women had made me excited, nervous, emotional, proud to be a woman. Seriously, I’d bring this book with me on the subway and with every birth story I read, I’d start crying uncontrollably. It was embarrassing. I had to stop reading it in public. But really – I started feeling more and more that I wanted to experience every minute of this. I wanted to feel it – to trust in my body’s ability to navigate it – to have the satisfaction of surviving it. I don’t know – it might sound silly, but that’s the way I felt. And now as it’s getting closer, of course I’m a little bit scared… but I’m also excited! I’ve learned so much and I feel prepared and I feel supported. I know that there is really no planning and that anything can happen, but at this point, I’m actually feeling kind of ready for this adventure. Meanwhile, since my doula Megan and I have started to get to know each other, she learned about my obsession with cheese. She happens to also have an obsession with cheese (I knew she was a good match for me from the moment I met her). In our last meeting, she told me about this Australian Feta cheese she had at the Bedford Cheese Shop in Williamsburg. She said it was completely off the hook – unlike any other feta she’s ever tasted. Unfortunately, they only had a limited supply and for months after the first time she discovered it, it was no longer available. Then on Friday, I got an email from Megan. She made a stop at the Bedford Cheese shop and they had the feta!! She grabbed a little for me because I just had to try it… and when could she stop by and bring it to me? So on Sunday she stopped by my apartment with her two adorable little boys and her husband and she delivered to me this heavenly gift of marinated Australian Feta. I mean really – Megan already ruled in my mind. She is so knowledgeable and confident about the birth process. She also has this chill and relaxing demeanor (without being hippy dippy), that I know I’ll find soothing and comforting during labor and delivery. But now she officially made me fall in love. She brought me cheese. She is now more than my doula. She is my friend. So thank you Megan – I’m so happy to have you along for this wild ride. Now – for the cheese. All I knew – was that this was an Australian goat and sheep’s milk feta, so I called up Bedford Cheese shop to learn more about the producer. This delightful feta is made in Victoria Australia by Meredith Dairy, who have won numerous awards for their top notch goat and sheep milk cheeses and yogurts. It comes marinated in olive oil with peppercorns and herbs (I only had thyme with my sample… but it looks like there’s some rosemary in the picture below). The feta is unlike any feta I’ve ever tasted. Instead of the typically drier and crumbly texture feta usually has, this feta is smooth, luscious and creamy. It is spreadable – like a cream cheese. And it has this delightful perfect tang. Yes, I actually just sat and ate mine with a spoon. It’s that yummy. I’m usually a cheese purist and tend to like it best without any other flavors involved, but the olive oil marinade only adds to the luscious texture of the cheese in this case, it enhances the flavor and it also helps to preserve it so it lasts longer! I totally need to go find me some of this feta. 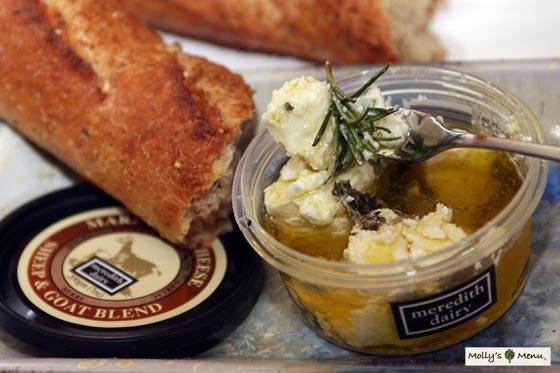 Now I’m craving a big Greek salad and some crusty bread with this magic goodness spread all over it. Mmmmmmm. It sounds wonderful…and it’s interesting that it’s not the crumbly feta we all think of. I will look for some here in Calif.
Nell, your blog made me emotional(bringing back memories of your and Erika’s births) and so proud of you. You seem to have the right attitude and are well prepared to have a great experience.. Mom and I are anxiously awaiting your call that you are in labor. See you this weekend. awww – thanks daddy. love you! Nell, we have to listen to our bodies. I´m sure yours will be intelligent enough to let you know what you need the moment you need it. I have friends that have given birth at home and everything was just fine. A friend from Switzerland wanted to give birth in the water and she did it, at home too. With her second child she felt that something was “wrong” (nothing life threatening of course) and she went to the hospital, the baby was in a wrong position and the doctor helped to place him correctly and everything went just fine too. She just felt it the second time, the same way she felt it was ok the first time. You´ll know. And you have your gouda and cheese lover with you. What else? Your husband!! everything will be just fine!! That was so beautiful Nell. Makes me fall in love with YOU! Thank you so much for sharing your process with us all. I’m so proud of you too, and so thrilled that you found such a knowledgable and supportive doula that you connect with so well. You’ll do great! Big big hugs to you, Brave Birthing Mama! I truly love you, and I find your posts so inspiring. Love this post Nell Bell. I’m so excited for you and inspired by you. You go, Super Mom!! I like the idea of being a good gouda. It’s a nice cheese for sure!